For many of us, the environment is at the top of our priority list when it comes to lifestyle. And businesses are catching on: people are more in tune with green ideas, and businesses are using incentives such as being carbon neutral as a way to attract customers. Recently, three green initiatives have been getting media attention in Canada, which are not only innovative, but in some cases, have the possibility of changing our culture entirely. The first idea was presented on Dragon’s Den, and is called Event Water Solutions. This group from Orillia, Ontario has devised an ingenious way to reduce waste from water bottles at events. Essentially, they bring in a large sink system with several taps that hook into a local water supply. To avoid cross contamination, the Event Water staff fills the bottles for event-goers. If clients don’t have a water bottle, they can purchase one from Event Water. As a customer, this is a great way to save money, especially considering that bottled water is more expensive per litre than gasoline (think about that next time you leave your home without your own water bottle!). When questioned by the dragons as to why companies would want to implement something that reduces their profit margin, the team responded by saying, “We’re getting calls everyday”. It may be idealistic, but this could represent a real shift in cultural thinking: it is better to reduce landfill rather than making a quick buck. This is long term thinking rather than short term gain. Next, we have Unplugged Small Appliance Recycling Program in British Columbia. According to the Unplugged website, in BC alone over 2 million small appliances end up in landfills every year; this means potentially hazardous materials going in to our environment. This recycling program, which has over 100 depots in British Columbia, is the first of its kind in Canada. They will recycle broken or used appliances, from toasters to electric toothbrushes to microwaves. Despite the small fee to cover the costs of staffing and recycling, it is well worth the positive effects on the environment. Visit their website for more information on how recycling reduces waste and energy costs in BC, and where you can recycle your small appliances. Finally, a green scheme worth considering for long term urban development in Canada is the housing innovation of recycled shipping containers. A recent article on the Yahoo Canada home page describes a single mom in California who built a home out of a shipping container for $4000. She did the renovating herself; cutting out spaces for windows and doors, then adding insulation to both the walls and the floor. This woman, who has gone back to school, chose to live mortgage-free and spend more time with her daughter, while helping the environment by using recycled materials for both the central home and an extension to the space. Although it is unclear how much the land cost to build it on, Lulu has picked up on a revolutionary idea that is getting more and more media attention. Yet, shipping container living has been around for several years now. In 2006, the History Channel ran a story about “Container City” located in the docklands of London, England.. Here, people can rent out 300 sq. ft. (the size of one container) of live-work space for $80-140 per month. It’s a cozy, but affordable space for people on a budget, especially here in Vancouver where renting 500 sq. ft. can cost upwards of $1500 per month. Built with 100% recycled materials, this Container City is a prime example of how to improve living conditions while being environmentally conscious. In Canada, we have our very own container architect, Keith Dewey, who is the owner and designer of Zigloo.ca (zigloo.ca). At approximately $150-250 per sq. ft. to build (compared to paying $600+ per sq. ft. in Vancouver), these Zigloo homes are affordable, compact, and modern, and are making use of materials “destined for the scrap yard” as Dewey states in the Vancouver Sun (http://zigloo.ca/vancouver-sun-zigloo-article/). Dewey indeed lives in his very own container home on Vancouver Island, which cost a total of $360, 000. 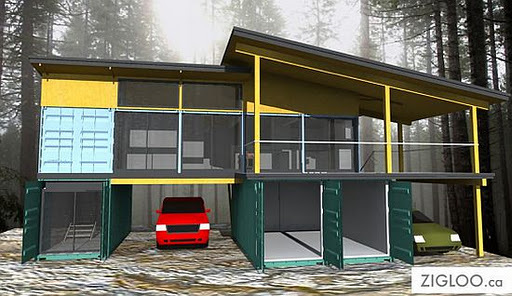 A Zigloo has also been designed for a residence in Squamish, titled the “Squamish Cargospace Living Project” (http://zigloo.ca/squamish-cargospace-living-project/). This home boasts the following green attributes: geothermal heating, wind power and a water recapturing system. It is unique, yet modern, and is reminiscent of Cam Frye’s super posh 80s home in Ferris Bueller’s Day Off. Other designs include enviro-friendly items like a green roof. Affordable housing has been on the political table for years in cities all across Canada, so my question to politicians and urban planners is what are you waiting for? Our country and its people are doing impressive things to help the environment, and these three ideas only have room to grow. You don’t have to live in a Zigloo to be green-friendly, but consider other ways you might reduce, reuse and recycle materials in your life. It is cost-effective and better for our planet in the long run.